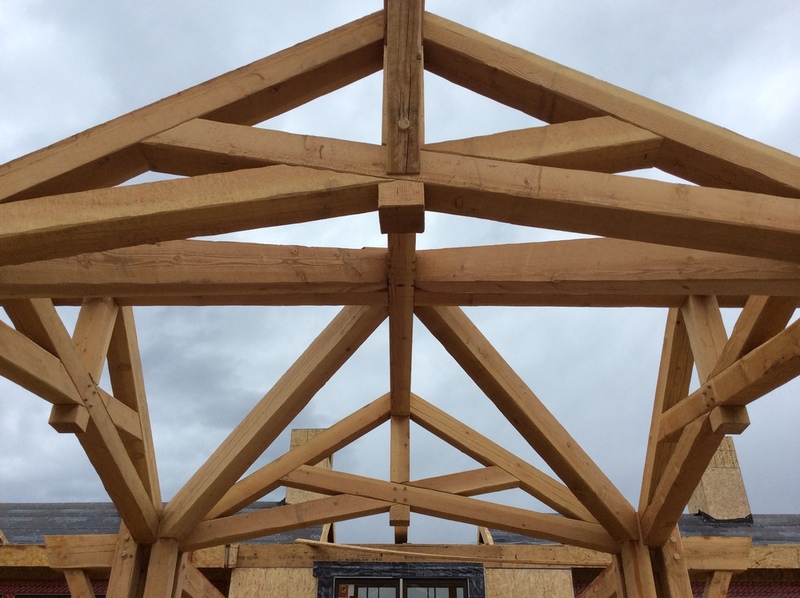 The finished timber porte cochere is absolutely amazing. (French: “coach door”) Passageway through a building, or gateway in an outer wall, designed to let vehicles pass from the street to an interior courtyard. Such gateways are common features of homes and palaces built in the grand style of Louis XIV and Louis XV. The term also applies to a roofed structure extending from the entrance of a building over an adjacent driveway. Hand cut custom timbers & trusses. When we were designing the house it became obvious that we were going to need some masterful craftsmen to construct the trusses and build the timber framing. After looking at some others we decided to go with Outlaw Timber & Woodworking and we're extremely happy with the result. Photos: Timber framing & trusses over the master bedroom. As you can see from the photos of the timbers over the master bedroom dormer, the construction is absolutely amazing. The joints are rock solid and tight and the posts and beams fit together like a glove. It's absolutely beautiful and when you're standing on the deck you can't take your eyes off of them.. it almost makes the view secondary.